Karate-do’ is a Japanese term which generally translates as “Empty Hand Way.” Although Karate-do is known to be an effective form of self-defense, it is also an equally effective form of mental and physical self-improvement, for adults and children alike. Through regular Karate-do training, the mind and body work together to become a unified force for self-protection. Karate-do training also provides vigorous exercise from which one can improve muscular and cardiovascular development as well as improving balance, coordination and reflexes. 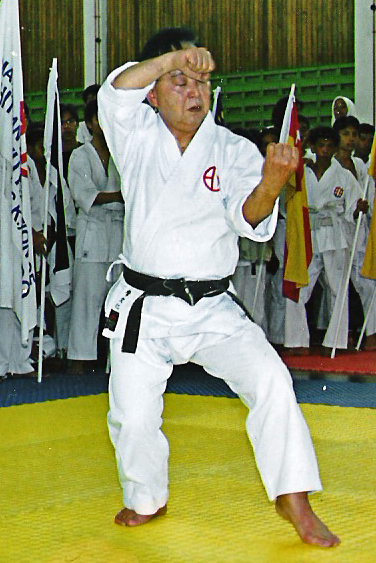 Shito-Ryu is one of the styles of Karate-do which is taught within the Kokusai Nippon Budo Kai. Shito-ryu is one of the major authentic styles of Japanese Karate-do which is still taught staying very close to it’s traditional Okinawan roots. The style was founded by Kenwa Mabuni, a student of Anko Itosu of Shuri-te and Higaonna Kanryo of Naha-Te. At KNBK dojo we offer Shito Ryu karate as it has been transmitted to us through the second headmaster of Shito Ryu, Kenzo Mabuni Soke, the founders son.